Sometimes, due to library reservation queues and the like, it takes me a long time to get to a book. And that's a good thing, because it tells me that it's being talked about, that it's being passed from hand to hand fever-quick and passion-bright, and sometimes it makes me nervous. I wonder whether these books that have had such buzz about them can live up to that noise; I ask myself if they can be all that I want them; I wonder whether they're worth the wait. But every now and then I forget all of that because I've got an alert about a book that I put it on hold a long time ago, and now it's finally here. And that moment will never not feel like Christmas. And oh my friends, El Deafo is everything. It's a treat; a fictionalised autobiography, drawing on the childhood experiences of Cece Bell herself, but allowing moments to merge together, and conversations and characters to be reshaped and remade for the story. It's rendered in a softly beautiful palette of sun-soaked colour and rich, rounded lines that allow this story of childhood to almost fall off the page and into your heart. God, I sound like some hideous advert you have on channel 339402 but forgive me because it's true. This is richness here, heartfelt and lovely and warm and honest storytelling. It is the story of Cece's deafness, caused by an illness at age four, and it is so beautifully personal, funny and honest, that it's difficult not to fall in love with it. But I fell in love with it a little more once I read Bell's potent afterword. She is, as she writes, "an expert on no ones deafness but my own" and provides some context on "what a deaf person might choose to do with his or her hearing loss". It's eloquent, calmly told truth, and something that underlines the great depth of El Deafo. This is a story of layers and texture, driven by Bell's personal experience but also her recognition that "our differences are our superpowers." A potent message for any age, but when it's teamed with art this adorable and a story with this much heart, it's almost irresistible. 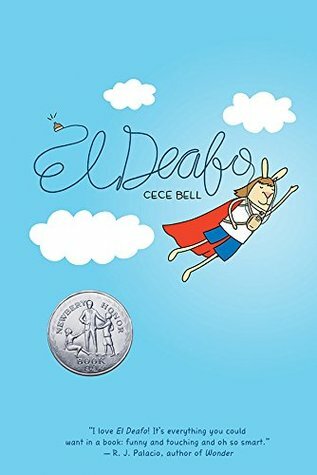 Sign into Goodreads to see if any of your friends have read El Deafo.